Sweeping, glorious fantasy romance about an orphan who must save her kingdom from the seductive and terrifying Darkling. The most compelling romance since Twilight. The Gathering Dark is one of those books which draws you in entirely from the first page and doesn't let you go. Be warned the review for this one is going to be short mainly because I'm not quite sure yet how to put into words my thoughts and feelings on this one. Needless to say it is awesome and I thoroughly recommend it. I liked that while this book was a fantasy novel it was accessible enough to someone who isn't into fantasy novels all that much. I think that was because the human relationships that feature in it are so realistic and natural that the scenes could have been played out anywhere and that gave me something to relate to. I loved Alina and Mal and seeing their relationship throughout the entire book right from back when they were children. I think, in hindsight, Mal was my favourite character and I loved him more and more as the book went on. I liked the world the book was set in. 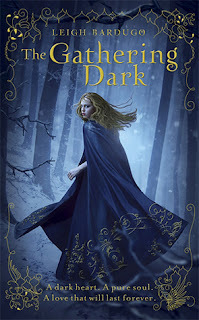 As Alina gets whisked away into the work of the Darkling you get to see the new world through her own eyes. I think that also helped to make the book quite easy to get into as you weren't just thrown in at the deep end and left to get on with it but saw everything for the first time with Alina. I loved that the book was pacey throughout. I found this meant the book was a particularly fast read as I found myself unable to put it down and needing to know what happened next. All in all a book I really enjoyed and would recommend. Can I have book 2 now please? Completely dying to read this! Still waiting on my copy to arrive though. I did not realize this had a different British title than US. I think I like this title more than the US Shadow and Bone. I also agree that this is a very accessible fantasy-I don't read a lot of epic fantasy but this book was just my style.